I wasn't originally going to make the dress lace up in back, but I'm too cheap to use a zipper. A zipper = $4 or so and you can buy a whole spool of ribbon for $0.50! 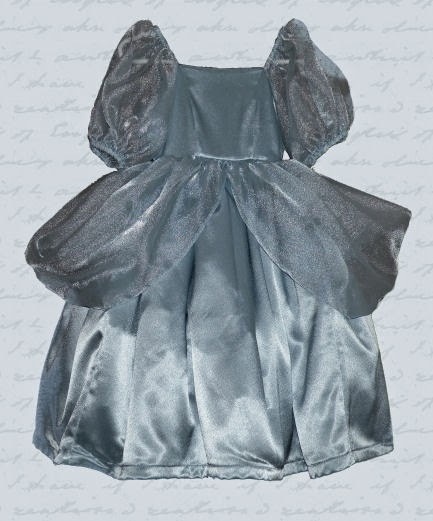 Besides, I'm going to use some scraps of the blue satin to make a cord for it...and this way it'll fit her longer because even when she's a little too big around for the dress, I can just tie the laces a little looser et voila! The other change I made to the pattern, besides getting the fit of the bodice right, was to add an underskirt or crinoline of bleached muslin and tulle to give it extreme poofiness. I think I went a little overboard because it is ridiculously poofy. She is absolutely adorable in it! Sometime between now and November 19th, I guess I need to buy some black velvet ribbon for a choker and find a suitable pair of "glass slippers." I'm thinking some of the silver sparkly shoes I saw at Target will work just fine. Does it ever bother anyone else that when you watch Disney's Cinderella the dress the Fairy Godmother makes for Cinderella is so obviously silver and is only tinted blueish because it's nighttime? But somewhere along the way Disney decided that Cinderella's dress is blue. It bugs me. A lot. Hubby just laughs at me though and tells me to just go with it. Besides, how can I convince Miss M that Cinderella's dress isn't really blue when every illustration she sees has Cinderella in a blue dress!? So daughter and husband are happy and I'm the odd man out. I don't really mind though...at least it's not pink! And she is seriously adorable! Now for the best part...she will be eighteen this March, and she STILL remembers feeling like a princess in that dress. Wow, what a great feeling as a mom to know that you gave her such a lasting memory! The dress really is quite heavy. The funny thing is that I purchased the exact yardage of fabric asked for on the back of the pattern and I'm pretty sure I still have enough left to make another entire dress (sans underskirt since I used leftovers from my stash for that). Stunning dress! And best wishes for your imminent arrival.